Bet Justin Gaethje to beat Edson Barboza at +115 with 888Sport. Bet Gaethje by KO/TKO at +155 with Betway. Parlay Fight Will Not Go the Distance at -560 with any bet at Karamba. On Saturday night at the Wells Fargo Center in Philadelphia, the UFC makes its second appearance on ESPN with a barnburner of a lightweight tilt. Sixth-ranked lightweight contender Edson Barboza takes on “The Human Highlight Reel,” Justin Gaethje. Since signing with the UFC in 2017, Gaethje has been responsible for two Fight of the Year performances and will likely be adding a third to his mantle after this weekend. It’s must-see action in Philadelphia for fans of UFC betting, and there are some must-bet opportunities as well. 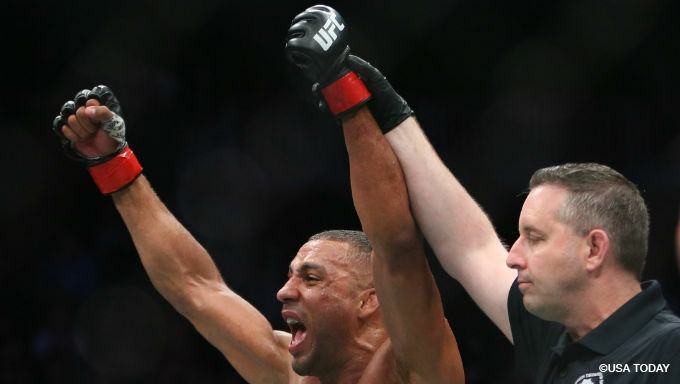 Edson Barboza is one of the most feared strikers in MMA today. Barboza’s style is based heavily in Muay Thai and he possesses arguably the most ferocious kicking game in MMA. When he’s able to work at his pace and preferred range, Barboza batters opponents with a variety of kicking attacks, most notably his leg kicks and spinning kicks to the body. Barboza also loves to throw hooks to the body, though his right is less effective than his left. Though not a novice on the ground, Barboza is by no means a grappler. Fighters who have taken him down have almost always had success, but Barboza is a staunch takedown defender when out in open space. If you can back Barboza up against the cage though, the Muay Thai specialist has been known to wilt under pressure and can be taken down much easier there. Justin Gaethje is, in many ways the inverse of Barboza. Gaethje’s style is built around forward aggression and pressure. It’s rare to see Gaethje take a step backwards. Instead, Gaethje marches forward with his head hidden behind a high guard, working his opponent up against the fence where he can go to work with uppercuts and hooks. The one thing Gaethje does share in common with Barboza is his penchant for leg kicks, which he employs liberally as he marches foes down. While Gaethje is largely a striker in the cage, he does have a strong wrestling background, having earned All-American honors in NCAA D-I wrestling. Gaethje’s biggest issue has been his propensity to take damage. Though his tuck and cover style is excellent at deflecting most shots, it leaves him very susceptible to body attacks. Barboza and Gaethje pose interesting threats to one another. Gaethje’s entire defensive acumen revolves around a high guard, which leaves his body and legs exposed, targets Barboza excels at aiming for. Conversely, Barboza has historically struggled to deal with any fighter who can pressure him, even if that pressure isn’t very sharp. Because he wants to kick at range, forcing him to move his feet throws off Barboza’s entire game and there are few fighters who pressure more relentlessly than Gaethje. On top of that, though he rarely employs it, Gaethje is a very solid wrestler which could give him an alternate avenue for success. 888Sport currently has Barboza as a -140 favorite with Gaethje as a +115 underdog, and to me, those odds should be reversed. Barboza has lost to every opponent who has effectively pressured him and Gaethje may well be the best of the bunch at doing just that. And if Gaethje wrestles early, a tactic which may well happen, then Barboza will be sapped of energy for the later rounds when Gaethje really turns up the pressure. Barboza will certainly have his chance to land game-changing strikes but Gaethje has proven to be absurdly durable so expect him to walk through the fire and breakdown Barboza the same way he has done so many times before. Gaethje at +115 is a great bet with 888Sport. An even better bet though, would be the Gaethje by KO/TKO prop at +155 offered by Betway. Considering the way these two match up, the offense both bring to the table and the fact that it is five rounds, there is almost no way this fight doesn’t end in a KO. Getting the added value on Gaethje is the icing on the cake. Along those same lines, the Fight Will Not Got The Distance prop at -560 with Karamba is essentially free money and a worthy parlay inclusion for any bet this weekend.